When a regular drill doesn’t make the cut, it’s time to call out a more specialized tool optimized for quickly and effortlessly reaching the tight and hard-to-reach spots. Unlike a standard drill, a right angle drill comes with a relatively shorter head and a lightweight and small profile. The advantageous physical attributes make them ideal for undertaking challenging and demanding applications such as plumbing, electrical work, carpentry, installing garage doors, and framing steel, among others. If you’re not sure which one would be ideal for your unique needs, read through our compilation of the ten of the best right angle drills. 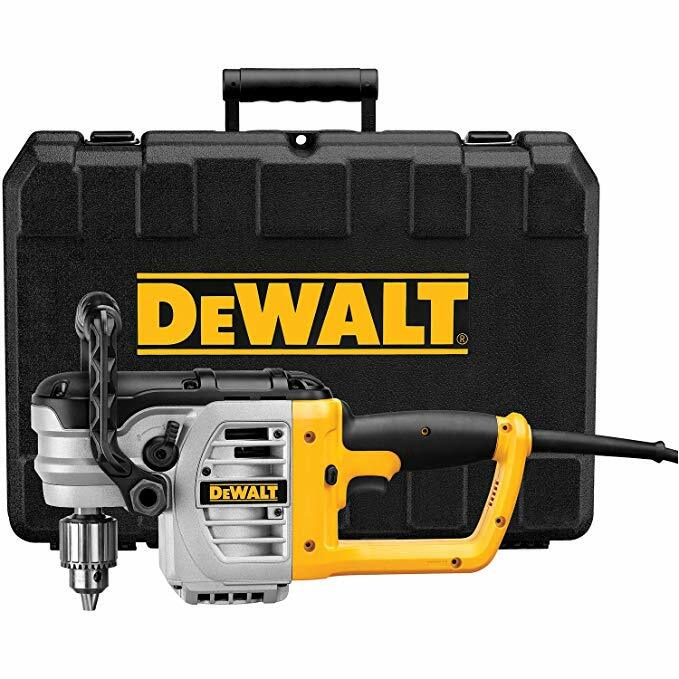 DeWalt is a household name, renowned for making high-quality, durable, high-performance, and easy-to-use hand and power tools. If the name doesn't ring a bell, it's probably because you're a greenhorn, right? 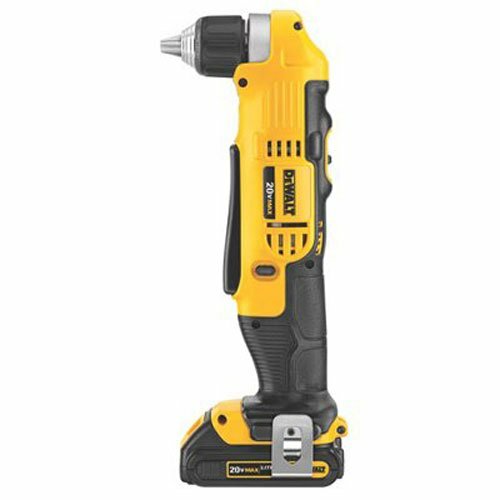 Anyways, one of the brand's flagship right angle drills – meaning that there are several – is the DeWalt DCD740C1. Admittedly, that's an ear-ripping, mouthful name but the performance of the model is on a whole new level. It boasts a compact design, dual speed settings for accurate performance, and a generous 36-month warranty to cover you against deficiencies in material and craftsmanship. With the pleasantries out of the way, now let’s get started on business. The DCD740C1 is armed to the teeth with a litany of performance and convenience features that set it apart from the stiff industry competition. It packs a high-performance motor that pairs nicely with its high-capacity 20V Max Li-Ion battery, providing you with plenty of power to quickly and effortlessly reach dual speed ranges of between 0 and 60 and 0 and 2000 rotations per minute. The result is unmatched precision, flexibility and versatility to take on a wide range of projects both around the house and on a commercial setting. Irrespective of the size of the project, the performance of the machine guarantees you a quick and efficient finish. As for usability, the right angle drill is both lightweight and compact, with a length of 4 inches and paltry weight of 3.9 pounds. In addition to the user-friendly design giving you unfettered access to hard-to-reach spots, it also greatly minimizes hand exhaustion. 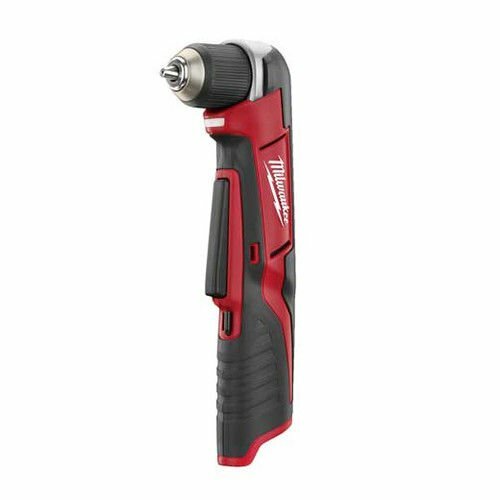 Couple that with the multi-grip trigger and you have a right angle drill you can use conveniently and comfortably for several hours on end with minimal effort and hiccups. To these add a fast charger, belt hook, and a heavy-duty case for conveniently carrying the right angle drill from site to site. It has all the features and modern technologies to help you finish your project quickly and efficiently. It’s cost-effective, high-performance and easy to use, making it an ideal choice for carpenters and handymen. Like the DeWalt above, the Makita DA3010F is jam-packed with all the whistles and blows to take the time and effort away from drilling in different materials. The right angle drill might not have the small and lightweight physical dimension of the previous pick, but it boasts a 10-5/8 inch body and a head that 2-5/8 inches wide, making it an ideal choice for users who frequently frame studs and have to access tight spots. And when the sun sets, and you find yourself working in a setting where the lighting conditions are less than ideal, you can activate the built-in LED light for adequately illuminating your workspace. This option might cede ground to the DeWalt in design, but when it comes to performance, it easily holds a candle to its rivals. The machine packs an incredibly powerful and dependable 4.0 Amp motor with a variable speed feature ranging between 0 and 2400 rotations per minute. With such immense power on the palm of your hands, you essentially become a jack of all trades, taking on a wide range of projects. It’s the versatility and all-roundness of this option that makes it the darling of re-modellers, carpenters, craftsmen, handymen and enthusiastic DIYers. The DA3010F is remarkably and surprisingly comfortable and convenient to use. It comes with a padded switch with a limiting dial to stop you from inadvertently over tightening fasteners. There is also a clutch for preventing any accidental damages to the gear, and works by disengaging should the gear bit bind accidentally. The likelihood of hand fatigue and strain are remote, thanks to the incorporation of an ergonomically designed barrel that substantially enhances comfort and ease of use. Additional features that stand out include an all-bearing design for longevity and a 12-month limited warranty. The tool is genuinely an indispensable part of any handyman's toolbox. The LED light, exceptional performance, the padded switch and ball bearing design all make it a worthwhile investment. When you need to accurately and quickly reach those tight spots, the machine has your back. Consumers in the West have this general misconception that power tools coming from China are inferior to those from other parts of the world both in performance and durability. We probably would be of the same opinion, too, if it weren't for the Milwaukee 2415-20. The performance, ease of use, durability, and ingenious design of the right angle drill effortlessly debunk such myths seeing as provides you with a level of performance that easily overshadows some high-end right angle drills from other parts of the world. The 2415-20 is arguably one of the most versatile machines on our list, thanks to its 3/8 inch ratcheting chuck. The feature enables the user to take on a myriad of light-duty to heavy-duty drilling projects on metal and wood workpieces without worrying about wear and tear. Additionally, it works smoothly and flawlessly and with remarkable speed, thanks to its powerful and high-performance motor that dependably delivers up to 100 inch-pounds of torque. And that's just the tip of the iceberg. For even superior and trouble-free performance, it also comes with an electronic clutch with up to 11 speed setting on top of a drill mode, giving you incredible control over your project so that you never sacrifice on precision. Like the previous right angle drill, this model also has a handy LED light for illuminating the workpiece in a setting where the lighting conditions are less than ideal. Expectedly, it is lightweight and compact and has an extended paddle trigger that conveniently allows for one-handed operation. Because it's battery-powered, you don't have to worry about portability or have to drag heavy power cables with you. And before the juice runs out, the built-in fuel gauge will warn you well in advance to avoid unnecessary interruptions. If your eyes are firmly trained on acquiring a right angle drill that’s both durable, budget-friendly, and easy to use, the 2415-20 is highly recommended. 125 pounds of torque and speeds of up to 1500 rotations per minute are hard to pass up. Like its previous brother, the DeWalt DWD460K is built for the heavy-duty applications on an industrial setting. Every nook and cranny of this option reeks of high-quality construction, and it sports a powerful motor to supply all the power you need to quickly and efficiently finish all the high torque applications that come your way. These, and the fact that it’s a cinch to use, make it an all-time favorite of most carpenters, contractors, handymen, and craftsmen out there. An in-depth review of the workhorse that’s DWD460K follows in subsequent paragraphs. It features a professional-grade construction quality to enable it to withstand the rigors of the trade and extend its lifespan considerably. The first evidence of the heavy-duty design is the metal gear housing that significantly increases dependability. Secondly, it comes with an easy-to-adjust front handle and 2-position side handle that together have a prowess for providing incredible leverage and control. It also benefits from a mechanical clutch that provides the gears with superb protection in low speeds. These features guarantee that with proper use and proper maintenance, the machine should provide you with several years of pain-free service. Because of the power and ease of using it, using it for stud framing is a great joy, devoid of the frustration, time and effort that other models demand. It features an incredibly powerful 11-1/2 amp motor capable of attaining decent speeds of up to 1300 rotations per minute. The unit boasts dual speed settings, making it a versatile choice for those who handle a wide range of tasks in the warehouse, construction site, or from their own garages. Thanks to the machine's bind-up control stall-sensing technology, the user will enjoy greater control over the reactionary torque, resulting in more accurate and efficient drilling and driving. On the flipside, you'll have to contend with the machine's massive weight of 21.7 pounds. Still, it's one of the best options on the market currently. The Ingersoll Rand 7807R has a lot going for it, the most outstanding of which is the user-friendly design. The machine features a lightweight and compact design, weighing a paltry 2.35 pounds and with dimensions of 2.3 inches by 9.1 inches by 4.6 inches, which means that unlike most cheap, off-brand right angle options, it's forgiving on the fingers, hands, and wrists. It won't cause hand strain or exhaustion, which makes it a solid choice for professionals drilling metal sheets, wood, and composites. When it comes to performance, it easily overshadows products from more established brands. For one, it features a heavy-duty 3/8 inch chuck that pairs greatly with the heavy-duty design. The highlight of the innovative design is the precision machine gearing that guarantees maximum transfer of power from the machine’s motor while prolonging its lifespan, so it provides you with several years of hassle-free performance. While it comes with a generous warranty, you might never have to use it since the right angle drill features a grease plug that makes carrying out maintenance work easy and quick. Irrespective of the work material you intend to drill, the 7807R has all the instrumental features to make short and quick work of it. The motor is powerful and is reversible, making it a solid choice for those professionals with a keen eye for convenient control. It's a tool you don't want to pass up for something better because, at its price tag, the deal doesn't get better, unless you're willing to dig deeper into your pockets, of course. Plus, it attains decent speeds of up to 1800 rotations per minute. If you work with sheet metal, wood, and composite and need a cost-effective, durable, and practical right angle drill, look no further than this option. 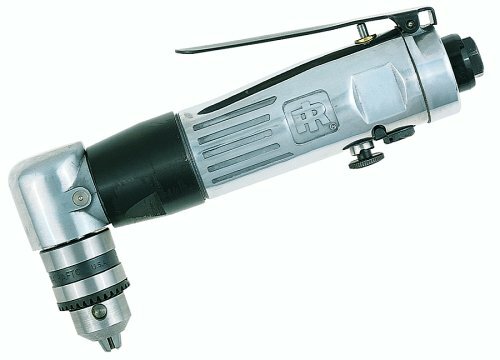 It has all the features professional and seasoned DIYers look out for before purchasing a right angle drill, and several more. Bosch PS11-102 might not immediately strike you as deserving of a position on this list but a peek beneath the hood reveals several impressive features. From a pivoting head, lightweight and compact design, variable speed feature, an auto lock chuck, to a high performance 12V motor, the tool has all the features that make for quick, effortless, and precise drilling. And in spite of being packed to the brim with all these fantastic features, the machine still features a budget-friendly price tag, making the ideal choice for value-conscious users out there. Like the high-end option that it is, the machine packs an endless list of performance features. It is equipped with a powerful 12V motor that works relatively quietly, smoothly, and dependably to deliver speeds of up to 1300 rotations per minute with corresponding 115 inch-pounds of torque, which qualifies it for the heavy-duty projects around the workshop. The speeds are variable via the user-friendly paddle trigger, meaning that if you want to undertake intricate projects, this option is your best bet. We’re just beginning to scratch the surface, so have a glass of water if you’re already overwhelmed. A signature feature is the head that’s capable of pivoting 5 positions between 90 degrees and 180 degrees. The design eliminates the need for straining to access tight spots as it grants you quick and easy access. Because of the chuck’s ability to lock automatically, replacing bits is a snap. The PS11-102 runs of a high-capacity 12V battery, and the lack of power cord means the machine is very portable. There is a fuel gauge to help you monitor the juice remaining, and a soft grip handle to allow you to hold it securely and comfortably and for longer. Its fastidious construction, uniform balancing, and powerful performance make it an ideal choice for users looking for nothing short of the best performance. And in that regard, the right angle drill never disappoints. There is every reason to love the Makita brand. It’s very consistent in engineering a plethora of high-performance hand and power tools, one of which is the Makita XAD02Z drill. The machine perfectly marries convenience with performance, providing the user with a cost-effective, practical, and functional tool for drilling and driving projects. The unit is additionally lightweight and compact and offers the user enviable ease of use and comfort. Read on to find out more. The XAD02Z provides an industry-best performance, thanks to its ingenious engineering and advanced technology. It is powered by a high-capacity and long-lasting 18-Volt Lithium-Ion battery, meaning that it provides for a longer runtime compared to other standard batteries on the market. And since it’s not electric, you can use it as far away from a power outlet as you want, so long as the battery is fully charged. And you won’t be weighed down by heavy power cables that occasionally get tangled with other objects in the warehouse. The professional design and engineering of the right angle drill aim to make it very easy to use. To this end, you get to use a soft grip handle that pair nicely with the small profile and strategically positioned paddle that together give you additional control and provide for comfortable handling for extended periods. It is also lightweight and compact, and it comes with a small profile 3-1/2-inch angle head that guarantees quick and easy access to tight and other hard-to-reach spots. With a length of only 12-3/8 inches, the right angle drill also features an ergonomic design. 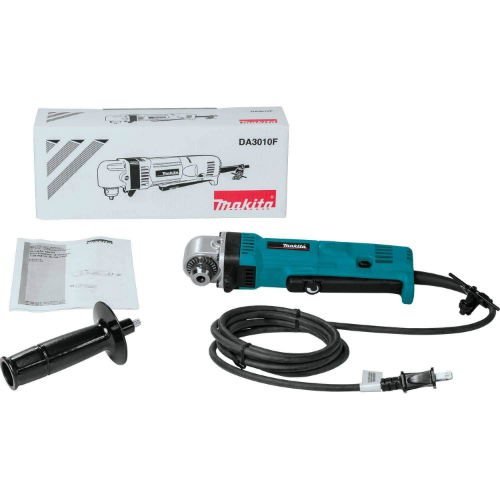 For professionals who assemble tools, frame steel, do electrical work, carpentry, and install garage doors will immediately love the performance and ease of using the Makita XAD02Z. Plus, it’s cost-effective and has a generous warranty. Makita's 4-pole motor is one of the most powerful ones out there, efficiently delivering up to 121 inch-pounds of torque, enabling you to power effortlessly and quickly through the toughest applications. There is also a variable speed feature that provides speeds of between 0 and 1800 rotations per minute, making for greater control and precise drilling and driving. Installing and removing bits is a snap, thanks to the 3/8-inch keyless chuck. 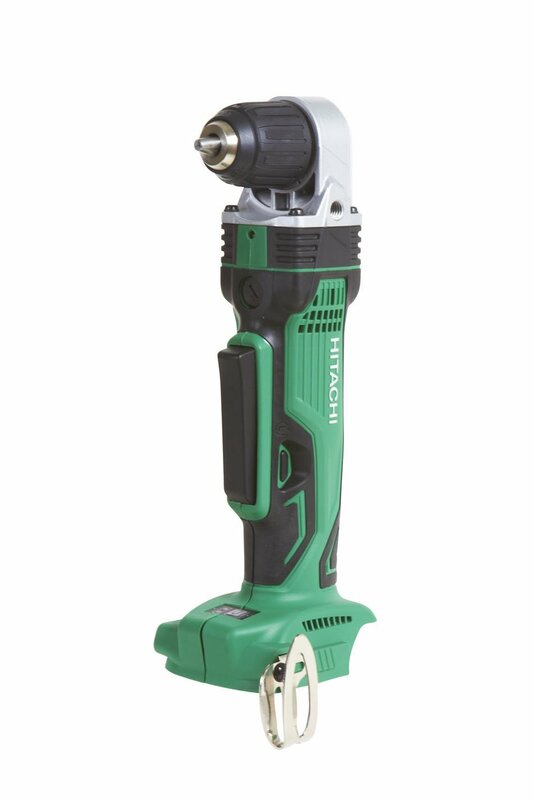 While flimsy, off-brand tools masquerading as right angle drills struggle to complete large-scale applications both around the house and commercially, the Hitachi DN18DSLP4 powers effortlessly through them. It completes the toughest jobs with minimal effort, and at a fraction of the time it takes run-of-the-mill alternatives flooding the market. It's easy to use and packs a broad range of effort and time-saving features, leaving with nothing but the best experience. Let’s now deconstruct the right angle drill to find out the features that lay underneath. Whether you're working with metal, wood, or composite, the drill packs incredible power to make for effortless and quick drilling or driving. The high-performance motor manages impressive speeds of up to 1800 rotations per minute. The tremendous speeds and resultant torque is more than enough, and easily meets or surpasses the vast majority of drilling and driving needs in hard-to-reach spots. As for comfort and control, the user-friendly variable speed switch immediately comes to your rescue. Furthermore, the right angle drill comes with a 3/8 inch keyless chuck that's compatible with a variety of bits and allows you to remove and install them with ease and speed. For convenience, it has a bright LED light for illuminating your workpiece and area and comes with a side angle to provide you with superior control and to ensure accuracy for effortlessly handling heavy-duty projects. Other auxiliary features include the side handle that's handy for when you need extra control in demanding projects and a convenient belt hook for keeping the tool within easy reach in between projects. The DN18DSLP4 is a powerful tool that boasts a lightweight and small profile and a powerful motor for the best performance. We can’t recommend it enough. 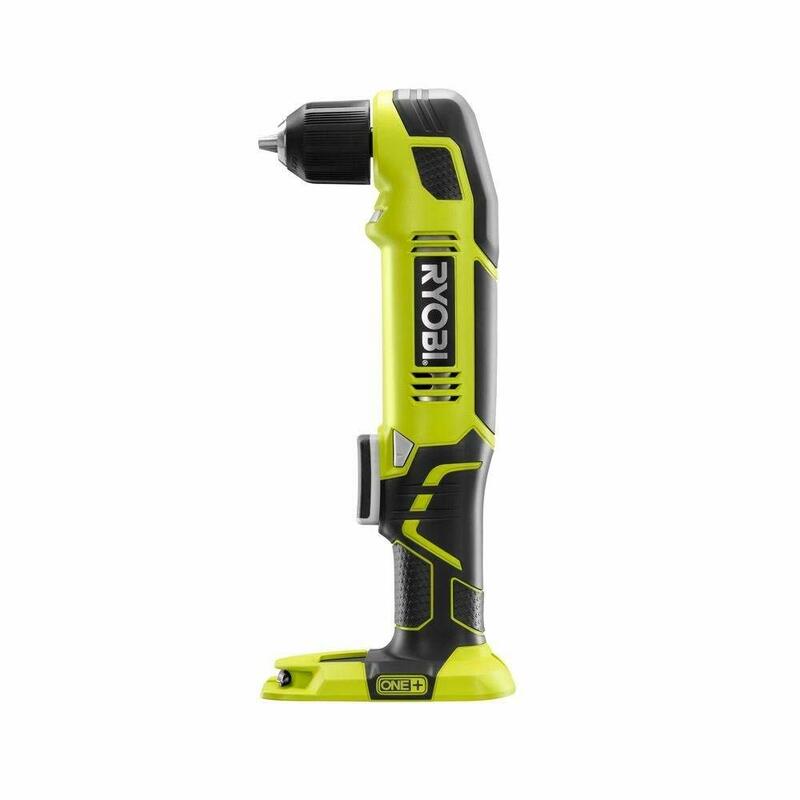 The Ryobi P241 One+ has a slew of positive attributes beginning with a conspicuously sleek and modern-looking design, high-performance motor, and a powerful battery that provides a considerably long runtime. The icing on the cake though is the small and lightweight design that provides for quick and easy access to all those spots you can reach with standard drills. The exceptional leverage and reach the long-neck design provides makes it an ideal choice for projects like plumbing and HVAC installation, among others. Unlike our previous pick, this model is only ideal for occasional drilling and driving of bits and studs around the house. The Ryobi P241 struggles when you subject it to heavy-duty, everyday use, especially considering that it packs just 130 inch-pounds of torque with speeds of up to 1100 rotations per minute. As a result, it's more at home in the garage or tool chest of an enthusiastic DIYers just getting started with drilling and driving projects. Still, it comes with a two-speed variable trigger for precision and the best drilling results. Other outstanding features include the useful LED light for professionals and DIYers who work in places where the lighting conditions are less than ideal, and a soft, rubberized grip to make it easy and comfortable to use for several hours on end. It might lack the power and torque for completing heavy-duty projects on a construction site, but it's very versatile and easy to use. It costs less also, but that only because it's a bare tool. 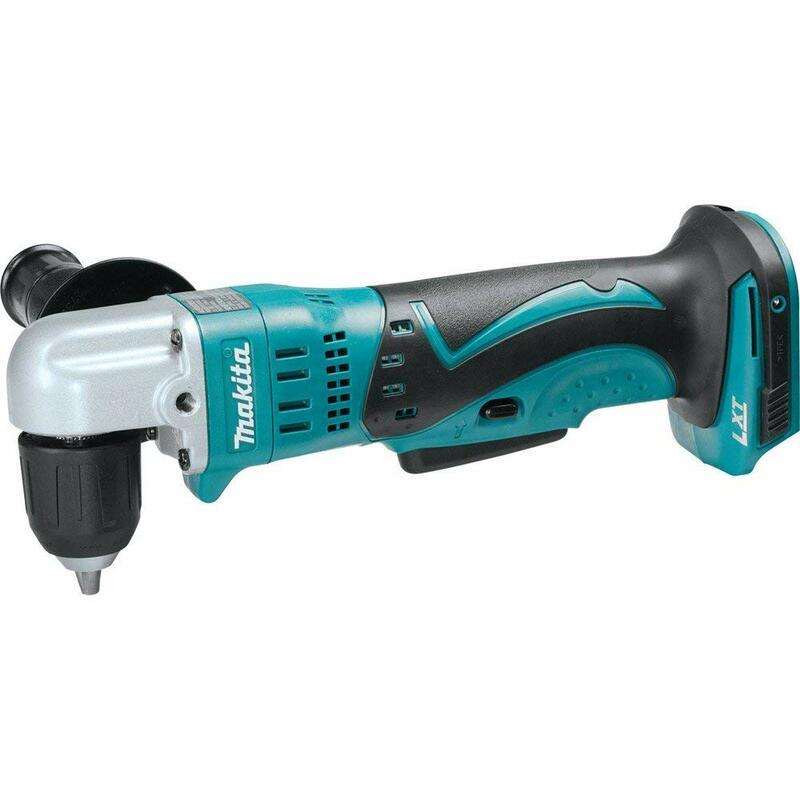 Still, it's a solid choice for the users looking for handy right angle drill for everyday use around the house. The design and engineering of the Bosch PS10-2A aim to enhance convenience and ease of use, and in that endeavour, the right angle drill excels. It's an ultra-light and compact machine. It gives you quick and easy access to tight spots, which also makes it ideal for use in confined spaces such as drawers and beams. The design is both time and effort-saving and brings to an end unnecessary trips between the project and the tool chest. In addition to being compact and short, the head similarly boasts articulating capabilities, pivoting effortlessly and conveniently into 5 various positions, turning it into a versatile and easy to use machine. 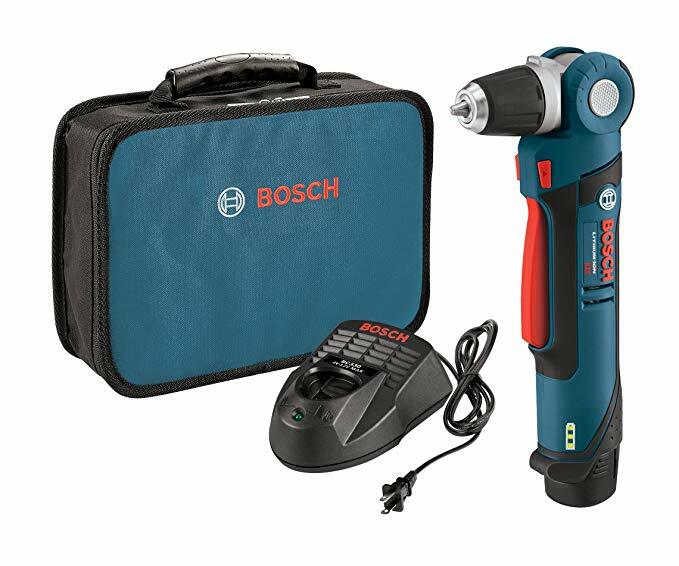 Handymen and craftsmen handling soft materials will appreciate the 7+1 electronic clutch that you drill through these materials with precision, eliminating the likelihood of over-tightening and inadvertently ruining your workpiece. The right angle drill also has a reverse function so that you can tighten or remove screws and studs. And using the machine is a breeze. You can quickly and easily change bits with the quick-change chuck. The same goes for changing 1/4-inch hex shank bits; it’s an effortless endeavour. To these features add the decent 80 inch-pounds of torque and a paltry weight of just 5.05 pounds and dimensions of 12.1 inches by 9.5 inches by 4.1 inches. The Bosch PS10-2A is clearly a feature packed machine and meets or exceeds performance, which explains the rave reviews online. It's ideal for both domestic and professional assignments. An essential consideration to keep in mind while shopping for a right angle drill is the amount of power and torque the machine is capable of generating. For regular, everyday drilling and driving around the house, mid-range models should pack just the right amount to enable you to finish quickly and efficiently. Heavy-duty applications involving abrasive workpieces and metals will require more torque than softer materials like, say, composites. The profile of a right angle drill determines, to a great extent, the level of success you’ll achieve with the machine. Given their job description, which is accessing tight and hard-to-reach spots, a right angle drill needs to be ultra-lightweight and compact. Getting one that’s both heavy and bulky beats the purpose. For superior performance, your preferred choice should have approximately 4 inches in length and feature a narrow head. While a small profile is ideal, keep in mind such models might lack the power and durability to withstand rigorous work on an industrial setting. The bit would not stay firmly in place if it were not for the chuck holding it. The vast majority of right angle drills come with chuck bits measuring 3/8 inches, and they provide the most efficient power transmission. Keep in mind though, that larger bits require more torque compared to smaller ones, which also means that they drain the battery much quicker or, in the case of electric models, consume more power. Q: What are the various uses of a right angle drill? A: They are versatile machines, and chances are high you’ll come across one in most warehouses, workshops, or garages you go to. The vast majority of them are used on joists, doors, mechanics, carpenters, and just about any professional who needs to do drilling or driving in tight and hard-to-reach spaces. Q: How are they powered? A: The machines are either battery-powered or corded. The former has the advantage of portability considering that you can use them just about anywhere though they’re a little heavy as they have high-capacity batteries. Their corded counterparts, on the other hand, pack more power but aren’t portable as they have power cords that attach to a power outlet. As is the case with most hand and power tools, no particular one is the absolute best. The best one is the most suitable one; the one that meets most of your unique requirements. And the best part is that our list features a wide range of them, so that irrespective of your drilling or driving needs, you’re bound to find something you need on it. The right angle drills on the list are high-quality, guarantee exceptional performance, are long-lasting and for the most part, cost-effective. We hope the list has imparted to you the knowledge you need to help you make an informed decision moving forward.